We are looking forward to participating in Mount Vernon’s annual Christmas Parade on Sunday, November 30th. It is a wonderful seasonal event for all ages. The community will be bustling with activity, and excitement will be high with the lighting of the greens on the square and the appearance of Santa Claus. 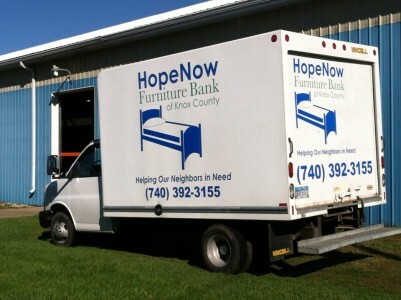 Come join the fun, and don’t forget to watch for our HopeNow Furniture Bank truck in the parade. We’ll be looking for you! On October 23rd, HopeNow Furniture Bank hosted the Heritage Centre Association’s monthly networking group. We were pleased to have local business representatives attend, hear about our organization and tour our facilities. Along with the enjoyable conversations over seasonal snacks, those present shared news, ideas and suggestions. We welcome these opportunities to interact with others of our community and county.